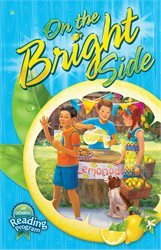 Delight and inspire your 3rd grader with On the Bright Side! This reader, complete with 13 stories, 1 play, 6 poems, 3 Light the Way feature pages, and 3 songs, includes selections of realistic fiction, missionary stories, animal stories, Bible stories, and historical fiction. Your child will enjoy selections such as the play “Hickory, Dickory, Dock,” E.B. White’s “Escape from Charlotte’s Web,” Louis Braille’s “All Because of an Awl,” Eddie Rickenbacker ‘s “Built for Speed,” and the story of Joseph. “Dig Deeper” sections allow your student to practice literary concepts including main character, plot, and moral, while “Think About It” and “What Do You Think?” sections develop his thinking skills and help him to apply the truths he has learned to real-life situations. Grade 3.